Please contact the artist for prices. The price of the original paintings includes white/off-white archival matting and metal frames. The paintings that are available as glicee archival prints are "The Hattie Creef," "The Cottages of the Outer Banks," and "Turner's Store." These archival prints are 12" x 16" and are unframed. Giclee prints capture the look and feel, and literally every nuance of the original painting—much more so than is possible with traditional printing methods. Original artwork is digitized and transferred onto the finest archival, acid-free paper with accurately matched colors utilizing sophisticated high-resolution printers. The artist is involved in every step of the reproduction process and approves the final product before final printing. 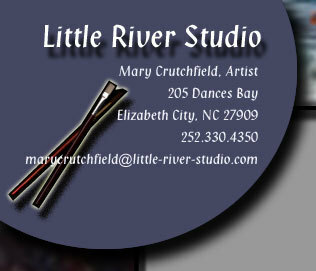 All artworks have copyrights by Mary Crutchfield. No art shown on the website can be reproduced or used without her written permission. The giclee prints available through this site are produced by Center Line Digital Printing, LLC. Please feel free to visit their web site at www.centerlineprint.com.